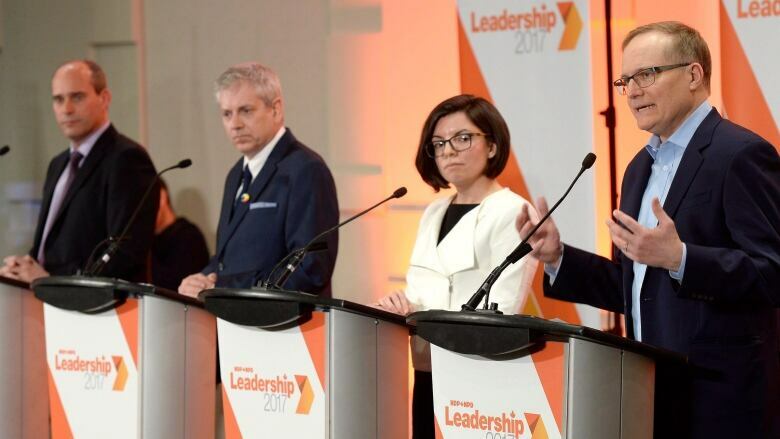 NDP leadership candidates will tackle issues relevant to the country's youth in the campaign's second official debate Sunday, but their biggest challenge might be winning young voters back from the Liberals. New Democrats vying for their party's leadership will gather in Montreal on Sunday for a debate focused exclusively on issues relating to Canada's youth — a demographic that swung in large numbers from the NDP to the Liberals in the 2015 federal election. The second of seven official debates to be held during the NDP leadership campaign will be broadcast live on CBC News Network and streamed on CBCNews.ca and Facebook starting at 2 p.m. ET. It'll include the four candidates currently in the running for the party leadership: Ontario MP Charlie Angus, Manitoba MP Niki Ashton, Quebec MP Guy Caron and B.C. MP Peter Julian. In 2015, young Canadians became an important voting bloc when they turned out to cast a ballot in record numbers. Elections Canada estimated that turnout among voters between the ages of 18 and 24 increased to 57 per cent from just 39 per cent in the 2011 election, significantly closing the gap in participation with older Canadians. The Liberals were the big beneficiaries of that increase in turnout. A post-election survey conducted by Abacus Data found that the Liberals took 44 per cent of the vote among Canadian millennials. The New Democrats took just 24 per cent of that vote. At the outset of the 2015 campaign, when the New Democrats were leading in the polls nationwide, they held about 42 per cent support among younger voters. Polls conducted in the last days of the 2008 and 2011 federal election campaigns had the NDP leading among the youngest cohort of Canadians despite the party's support among all voters placing it in third place in 2008 and well behind the Conservatives in 2011. Polling suggests that nearly half of the young voters who had cast a ballot for the NDP in 2011 swung over to the Liberals in 2015. But the party might have lost even more of that support since the election. According to Abacus Data, the NDP was at just 19 per cent support among millennials in February, a statistically significant drop of five points from the polling firm's post-election survey. That would put the NDP at a recent low. According to the Canadian Election Study, the New Democrats have taken at least 20 per cent of the vote among 18-to-30-year-olds in every election since 2004. In the 2016 federal budget, the Liberals did not deliver on all of their election promises related to youth, including funding for pre-apprenticeship programs and employment insurance breaks for employers who hire young workers. Investments in youth job creation and co-op placements was also well below what had been promised, and the results from doubling the funding for the Canada Summer Jobs program resulted in little increase in summer youth employment. Though the 2017 budget delivered $395.5 million in additional funding over the next three years to the Youth Employment Strategy and $221 million over five years toward more co-op placements, the Liberals have yet to fulfil their commitments on employment insurance and pre-apprenticeship programs. Unemployment among young Canadians is roughly double of what it is for other Canadians. Accordingly, it was the top issue for youth in a 2016 Abacus poll of Canadians between the ages of 18 and 25. Accessible and affordable post-secondary education was ranked second in the survey. The NDP, unlike the Liberals, has promised to reduce tuition fees. By arguing that the Liberals have not lived up to the hopes of Canada's youth — who turned out in record numbers to vote for Justin Trudeau in 2015 — these lapses could be exploited by the New Democrats in order to win back the favour of young voters. It's an argument that will likely be made at length at the Montreal youth debate. But the leadership contenders will be largely speaking to those party members who will choose the next leader of the NDP. Their message will need to resonate beyond the party's base in order for the New Democrats to succeed. Candidates will field questions submitted by the New Democratic Youth of Canada and from the general public through the party's website. The bilingual debate will be moderated by two former NDP MPs, Rosane Doré Lefebvre and Hoang Mai.